Is your extension spring failing to fulfill your requirements? Extension spring failure happens when a spring is either too weak and can’t meet the loads, or too strong and over stressed. If the spring is too weak, it will achieve a longer loaded length than required under your desired load. If it is too strong, it might not stretch enough or it may be caused to take a set if forced to travel beyond its capacities. When an extension spring is highly stressed, it will be a strong spring but its elasticity will be limited. 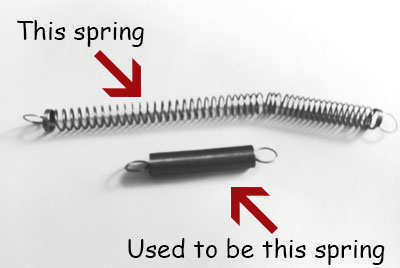 The image to the right shows what a spring looks like after it has taken a set. The spring basically loses the initial tension it had stored to keep the coils together so its coils now have pitch in between them, it isn’t able to go back to its original length, and it has lost both force and deflection. To correct your failed extension spring design, you must first identify the problem. Whether it is too strong, too weak, or too stressed. Then, you may follow the extension spring force chart shown to the right. If your spring is too strong, you may either increase the outer diameter, decrease the wire diameter, or add more coils by making the body length of your extension spring a bit longer. Remember your spring has to meet a maximum length inside hooks to be installed properly so you must make sure you don’t exceed this maximum length inside hooks when adjusting the coil count. If the spring is too weak, you do the opposite; decrease the outer diameter, increase the wire diameter, or reduce the amount of coils by making the body length shorter and increasing the length of the hooks. In the case that your spring might have the right spring rate but is under a lot of stress thus not allowing you to travel as much as you’d like, you must make both adjustments to make it weaker and stronger. This is because, in order to release stress from the spring, you must make it weaker but then make it stronger to keep the strength it previously had. If you only make the spring weaker, your spring will travel more than expected under your desired load. So for these types of adjustments you must follow both sides of the force chart.